San Francisco's summer is slowly fizzling, meaning it's time to hurry and hit up some temperate outdoor dining before ... crap, it's over ... wait, it's back! We've asked local outdoor-seating spots to whip us up off-menu, request-only dishes available through September. Go play outside. Corks: Just across the Golden Gate, this forest-abetted Russian River escape'll be hooking up a free glass o' their vineyard's best (Botrytis Chardonnay) to all Thrillist mentioners, plus dishing out a lunch-time Maine Lobster Roll and New England Lobster Pie to anyone using the code word "New England", completely eliminating the need for them to specify whether the clam chowder's red or white. Lafitte: Make your way over to the only resto on Pier 5 named after a smuggler/privateer/pirate for The Baptiste cocktail: a flaming drink served hot in a coffee mug that's made up of brandy, orange peel, cloves, cinnamon, sugar, and Caffe Vita coffee -- suggesting the best part of waking up is...not Folger's. Delarosa: Get your rustic Italian on at this Marina-side eatery with an enhanced Margherita Pizza Joel McHale would approve of: the "So Meaty" comes packed with hot salami, pancetta, sausage and spicy coppa, which unlike spicy NOPA, isn't an obnoxiously imaginary fabrication. Pican: Boasting the Bay's most comprehensive Bourbon selection, they're hooking you up with pitchers of cocktails on their Broadway-facing patio, including a Kentucky Bourbon Sangria (Maker's/red wine/maple syrup/lemon) and a Cajun Lemonade, made with vodka, Pimm's No. 1, lemon juice, Tabasco, and syrup from Rock Sugar, who wants to know if you can smell what it's cooking, but is really, really nice about. Gitane: Just off Union Square, this standbye (named after a gypsy woman) is serving up a special Maracaibo cocktail (named after the second largest city in Venezuela) with lemon juice, Tahitian vanilla, egg white and Diplomatico rum, which makes you extra eligible for being jailed. 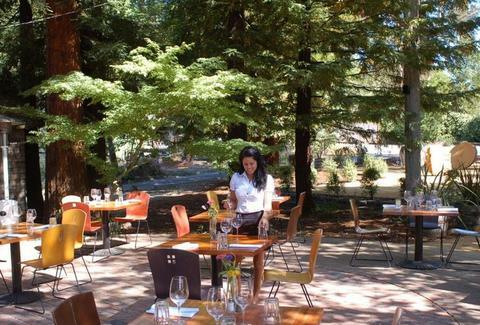 Madera: For some fine-dining overlooking the Santa Cruz Mountains, special-order some homemade beef jerky, lovingly crafted from thickly-cut meat sourced from Niman Ranch, where unlike at Nieman Marcus Ranch, the dudes don't tease you for shopping with mom.